Hi there! We’re Jenny Peters and Rebecca Bogart, the Ukulele Sisters. 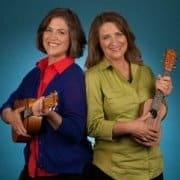 We’ve been publishing books on how to play ukulele since 2013 and have sold over 50,000 copies worldwide. We believe that people playing music make the world a better place, and we’re thrilled to support you on your ukulele journey. Right now we’re working on our next book, 21 Easy Ukulele Hymns, which we plan to release in late Spring 2019. In the meantime, please take a look around. 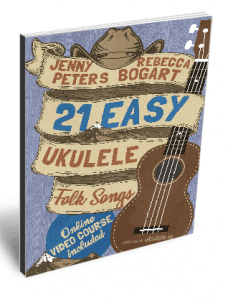 Learn 21 classic folk songs arranged in order of difficulty. The book begins with easy 2 chord songs and progresses to 7 chord songs in the key of G major. Includes favorites such as Happy Birthday, Take Me Out to the Ball Game, and Shenandoah. Comes with a video lesson for every song. When you sign up for our email list you’ll get a newsletter with the new Youtube video for the week plus free downloadable sheet music that goes with the video. Having the chords, lyrics, and strumming patterns in front of you makes it easier and more fun to play along with the video. Play the song at your own speed, or practice just the parts that are hard without having to search within the video. We recently had a technical SNAFU as we changed web hosting providers. If you are having trouble logging in or did not get the free sheet music you signed up for, please sign up again or contact us.